Checking with your vet is a good way to determine when to begin offering solid food to your puppy. Many pet owners suggest beginning solids, in addition to nursing, at around 4-6 weeks. This is a guide about, "When can I start feeding a puppy solid food?". Question: When Can I Start Feeding a Puppy Solid Food? When can I introduce my puppies to puppy food instead of just nursing? I have experience in raising puppies from 6 to 8 weeks onward, but I'm a lifetime owner, not a breeder, so don't know as much about the itty bitty ones. 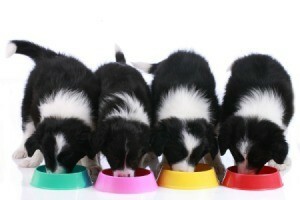 As I understand, and depending upon breed, most can start eating solids between 5 and 6 weeks. To be sure, contact your vet. He or she should be able to give you a good guideline to follow. As well, each pup is different even within same litters. Some may be several days ahead or behind of litter mates so keep trying. They will eat as soon as they can! :-) Good luck. We use to breed Dalmations and had about 5 litters altogether. The mom has a way of weaning her puppies. Just like babies you can tell if the puppies are getting enough to eat. I would usually start the puppies at 4 weeks with baby cereal, 2% milk, and puppy chow on a pie plate once daily. We always used a kiddy swimming pool for the puppies. Having all of them in confined area helped the mom corral her puppies as well as keeping the area clean. You could always talk to the vet to see what he says. Hope this helps.